Their infatuation may have started the day they had to plumb each step forward in the rain with their hiking sticks to avoid falling into the peat bogs, or perhaps when they survived five feet forward visibility, driving rain and the cold to ascend and then find their way down the mountains of England’s Lake District. 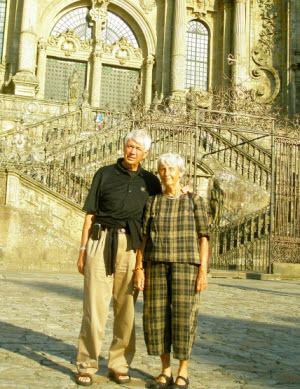 In any case, after completing their first long multi-day hike, the fabled Coast to Coast Walk across the width of England, in 2002, Bill Horwich ’60 and his wife, Mijo, have been hiking ever since. Each subsequent vacation (Bill is still practicing law in Berkeley, CA most of the time) has found them setting off on a major “walk” (the English term for long hike). They have completed, in seven annual installments, the 1,350 mile legendary medieval pilgrimage trail from le Puy en Velay in the center of France to Santiago de Compostele in northwestern Spain, a week-long trek in the Anapurna Range of Nepal; and this past spring, the 105-mile Cotswold Way from Bath north to Chipping Campden, through picture postcard countryside in England. Next up: probably Brittany and Normandy in Mijo’s native France. Bill and Mijo are pictured shortly after their arrival (and a shower) in Santiago de Compostele in September, 2011, at the end of the final 220 mile segment of their walk along the pilgrimage trail.